Part of a fresh new crop of young, African talent that are making their way through La Masia system, Cameroonian Jean-Marie Dongou is the man that everyone is getting excited about. Making quite an impact at the age of 18, Dongou carries a rawness that makes him suited perfectly to the Barcelona youth system, as they attempt to mould him into one of their own. Whilst the “New Samuel Eto’o” dubbing is largely down to a lazy link to their shared homeland, there is a certain degree of truth in the shared attributes between the two – though of course Dongou’s are somewhat less refined. Indeed, a product of the academy set-up by the man everyone is comparing him to, the Samuel Eto’o Foundation was where he was picked up by Barcelona at the age of 13. 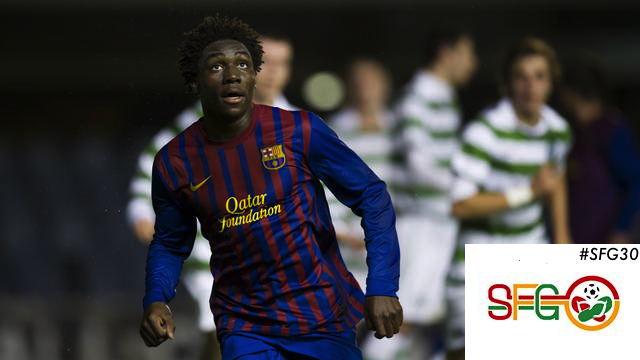 Along with his Cameroonian teammate at Barcelona B Franck Bagnack, the foundation has has an agreement allowing them to pluck the finest talent from around the West African country, and it’s links to the Barcelona academy can only be good for the future of the national team. Whilst Dongou has yet to make an impact on the full national team setup, you can certainly see him progressing through at a later date once he makes an impact more in the domestic game. Indeed, many are predicting him to have a place in the squad this summer at the World Cup, as perhaps a sort-of “tournament experience” type idea. Currently plying his trade in the Barcelona B team in the Segunda Division of Spain, Dongou really made a name for himself in the the now defunct NextGen Series in the 2011-12 season, scoring an impressive 7 goals despite Barcelona not getting out of the group stage, scoring in every match but one. Joint-top scorer with Ajax’s now star-player Viktor Fischer, his most impressive performance came in a 5-1 win over Celtic, as he scored a hattrick in a riotous result at home. He didn’t compete in the 2012-13 series as he graduated from the youth set up to play a more prominent role in the Barcelona B team for last season. Playing a handful of games in the 2011-12 season, last season his run in the Barcelona B team was largely limited to a substitute appearances late on in games, meaning he only managed 5 goals in the league – though did have a good goals/game ratio of the games he did start. Somewhat stagnated this year, he has found himself employed more in a right-wing role as well as the central role in the front-three, meaning he has only scored the one goal despite starting most games. Injuries too have limited his appearances this season, so Dongou will be hoping that a consistent period in the team will help his development. He was included in the squad for the games against Getafe and Granada, but failed to make it off the bench on both occasions. Most of his first team appearances have been in friendly games, where he scored two goals against Valerenga and a tap-in against Santos, as well as scoring a goal in the Copa del Rey against Cartagena after coming off the bench. His strengths lie in the directness of his play, with his strong frame and powerful running style combined with a good amount of pace see him take on and beat defenders for fun. As well as this, his strong right foot means that his goals come from both outside the area, you can certainly see where the comparisons with Eto’o come from. However, like many young players who possess the talent he does, his team play is somewhat lacking – but this is something that will almost certainly come with age. The raw talent is certainly there, and it may be that Catalan football may have a more African flavour to their legendary style of play in the not-too-distant future.